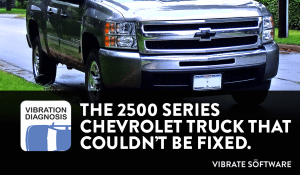 The 2500 Series Chevrolet Truck That Could Not Be Repaired - Vibrate Software, Inc. While listening to the service manager describe the history of this vehicle, I learned that in an attempt to repair the vibration, the dealership service department balanced the tires several times and had the driveshafts balanced; nothing would fix this vibration. The vehicle must be a Lemon, it can’t be fixed. Using the same diagnostic procedure outlined in our new NVH smartphone app, the technician who had been working on the truck and I performed a quick road test of the Truck. The results of the road test indicated that the vehicle had a third order tire speed related vibration. As the NVH app’s own diagnostic help file indicates, third order tire speed related vibrations are only caused by a few select problems on the vehicle. While the technician and I were working our way down this list of items to check, we could not find any problems with any parts, but I did notice that the front of the vehicle was sitting a little higher than I thought it should. We checked the ride height of this truck to another truck on the sales lot, it was too high. This truck uses Torsion bars as the front suspension springs. The torsion bar tension (and ride height) are adjustable with bolts at the crossmember attached to the frame. We adjusted the Torsion bars to set the front suspension ride height to the proper level and performed another road test; the vibration was gone! The vibration was caused by excessive inner Tri-Pod CV joint angles. The CV joint inner shaft was actually binding on the outer housing three times per revolution of the tire. This caused the third order tire speed related vibration. There were no bad parts on this vehicle, only a simple suspension ride height adjustment was necessary to repair the vibration. One very unhappy customer was the result. Hundreds of dollars were wasted on attempted repairs, many hours of labor were wasted because nobody really knew how to diagnose a vibration problem; they were just guessing! The NVH app eliminates the guesswork in vibration diagnosis and guides you step-by-step through the entire diagnostic and repair procedure. Get the NVH app today by clicking on the link below.